Afg v Ire: History was created on Indian soil but by Afghanistan. Afghanistan vs Ireland: Mohammed Shahzad was the centre of attraction after Afghanistan created history by winning their maiden Test match. 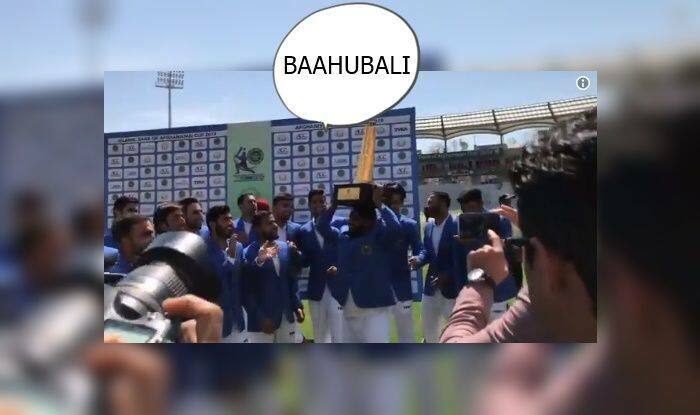 ‘Beefy’ Shahzad was given the responsibility of lifting the heavy trophy, once he lifted it, his teammates started chanting ‘Bahubali, Bahubali’. Not just the players even the crowd joined in the chorus. ‘Bahubali’ is a popular Indian film and the term means ‘muscular’. The team was elated after defeating Ireland by seven wickets. Here is the video where you get to see Afghanistan players refer to Shahzad as ‘Bahubali’. Rahmat Shah bagged the Man of the match for his splendid show with the bat as he amassed 174 runs in the Test. Rashid Khan as expected was the pick of the bowlers as he scalped seven wickets in the Test. “Happy that we won. Really happy for my team, people and the cricket board. Before we used to play two-day, three-day cricket and now we are playing the longer form and getting to play Test cricket. So, it’s a special feeling. I want to congratulate all the lads in the team, they have been absolutely brilliant. We have got a few games before the World Cup and we want to make every opportunity count,” said Afghanistan captain Asghan Afghan. Afghanistan took only two Tests to clinch their maiden win which is a record only second to Australia.